I'm all for letting Mark Zuckerberg and his new wife Priscilla Chan honeymoon in peace, but I couldn't resist blogging about two noteworthy events that occurred during the newlyweds' Italian vacation. First, the Facebook Founder and CEO took his bride to a *kosher restaurant in the Jewish area in Rome. The couple dined at Nonna Betta where they spent 32 euros on lunch. There's no word on why Zuckerberg decided to visit the Jewish section of Rome or why he and Priscilla chose a kosher restaurant for lunch. 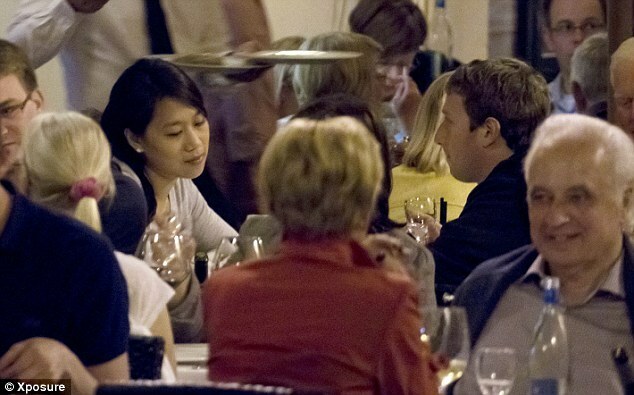 Mark Zuckerberg and his wife Priscilla Chan at a kosher restaurant in Rome. At Nonna Betta, Zuckerberg and Chan ate traditional Roman Jewish delicacies including deep-fried artichokes, fried pumpkin flowers and ravioli stuffed with sea bass and artichokes. To drink they each had a glass of water and shared a pot of hot tea. In addition to Zuck's decision to eat kosher ("When in Rome!") the second notable aspect of the couple's Roman visit was the young billionaire's failure to tip at the restaurant. Waiters at Nonna Betta reported that Zuckerberg acknowledged he was Mark Zuckerberg and then neglected to leave a gratuity. That's an odd omission from someone who's portfolio increases by approximately a billion dollars every time the Facebook stock goes up two points (since its IPO the stock has actually decreased by about 25%). 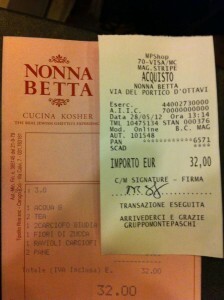 The restaurant receipt from Mark Zuckerberg's lunch at a kosher restaurant in Rome. It's possible that Zuckerberg thinks that it's unnecessary to tip in Rome since he reportedly didn't leave a tip the night before at a dinner at Pierluigi (not kosher), a historic trattoria in the heart of Rome. In all fairness to Zuckerberg, it doesn't look like there was any place to add a tip on the receipt (above). Perhaps Zuckerberg and Chan will continue to seek out kosher fare when they return to Palo Alto. On behalf of the waitstaff I just hope he learns to tip! *UPDATE: Nonna Betta restaurant in Rome is no longer certified kosher. Tourists should consult a local rabbi regarding the kosher status of this restaurant. In the EU, we no longer tip in most countries. Nonna Betta is NOT a Kosher restaurant for a few months already, please fix. Menachem: If you look at the bill you'll see the restaurant's logo and under it it says in Italian "Kosher Restaurant" and then has small font indicated a hekhsher. If they lost their hekhsher they should remove that from the bill. The point now is that no Jewish blog should write he is Kosher, it's a Issur of Lifnei Iver. This post is relevant to what?